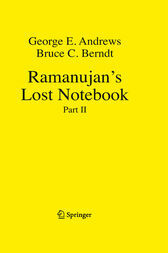 This is the second of approximately four volumes that the authors plan to write in their examination of all the claims made by S. Ramanujan in The Lost Notebook and Other Unpublished Papers. This volume, published by Narosa in 1988, contains the “Lost Notebook,” which was discovered by the ?rst author in the spring of 1976 at the library of Trinity College, Cambridge. Also included in this publication are other partial manuscripts, fragments, and letters that Ramanujan wrote to G. H. Hardy from nursing homes during 1917–1919. The authors have attempted to organize this disparate material in chapters. This second volume contains 16 chapters comprising 314 entries, including some duplications and examples, with chapter totals ranging from a high of ?fty-four entries in Chapter 1 to a low of two entries in Chapter 12. Contents Preface . . . . . . . . . . . . . . . . . . . . . . . . . . . . . . . . . . . . . . . . . . . . . . . . . . . . . . . . vii Introduction . . . . . . . . . . . . . . . . . . . . . . . . . . . . . . . . . . . . . . . . . . . . . . . . . . . 1 1 The Heine Transformation . . . . . . . . . . . . . . . . . . . . . . . . . . . . . . . . . 5 1. 1 Introduction . . . . . . . . . . . . . . . . . . . . . . . . . . . . . . . . . . . . . . . . . . . 5 1. 2 Heine’s Method . . . . . . . . . . . . . . . . . . . . . . . . . . . . . . . . . . . . . . . . . 6 1. 3 Ramanujan’s Proof of the q-Gauss Summation Theorem . . . . . 10 1. 4 Corollaries of (1. 2. 1) and (1. 2. 5) . . . . . . . . . . . . . . . . . . . . . . . . . . 14 1. 5 Corollaries of (1. 2. 6) and (1. 2. 7) . . . . . . . . . . . . . . . . . . . . . . . . . . 22 1. 6 Corollaries of (1. 2. 8), (1. 2. 9), and (1. 2. 10) . . . . . . . . . . . . . . . . . . 24 1. 7 Corollaries of Section 1. 2 and Auxiliary Results . . . . . . . . . . . . . 27 2 The Sears–Thomae Transformation . . . . . . . . . . . . . . . . . . . . . . . . 45 2. 1 Introduction . . . . . . . . . . . . . . . . . . . . . . . . . . . . . . . . . . . . . . . . . . . 45 2. 2 Direct Corollaries of (2. 1. 1) and (2. 1. 3) . . . . . . . . . . . . . . . . . . . . 45 2. 3 Extended Corollaries of (2. 1. 1) and (2. 1. 3) . . . . . . . . . . . . . . . . .